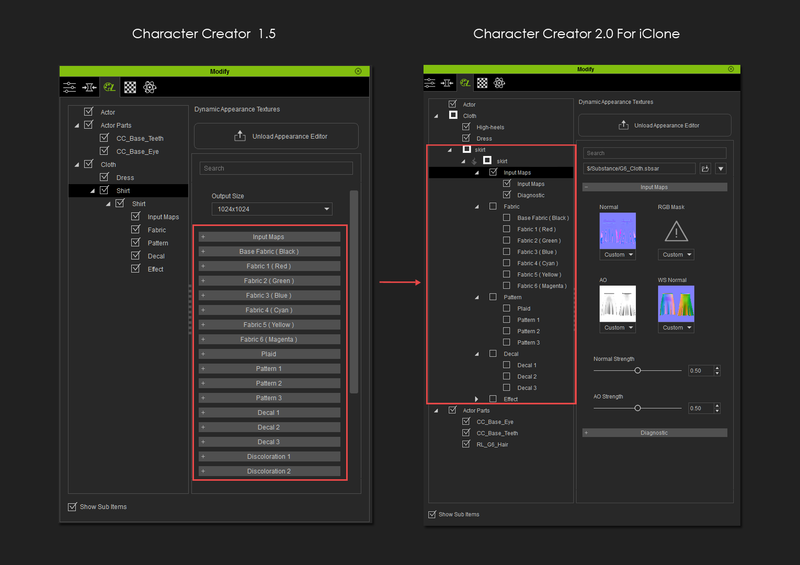 Character Creator 2.0 Official Version will have a PBR enabled Appearance Editor. For this Beta version, one can import a PBR enabled sbsar file for usage. We have also provided for Substance Preset support which will let you save a XML formatted file with the extension *.sbsprs facilitating Substance material exchange. In the previous version of Appearance Editor, the parameters and parameter groupings would show up in the same area making it difficult to tell them apart and thus hard to use. For more convenience, the parameter groups will be separated into the Substance Tree List letting one efficiently focus on a specific Substance category. [B] Use the checkboxes to enable the sbsar material for editing. [A] The current material being worked on. [B] The current sbsar being worked on. [C] Displays the sbsar path being used now. Change out the sbsar by dragging it to [B] or turning it on. Check Online Manual HERE (Load) & HERE (Save). A demonstration of importing customized sbsar along with self made presets.